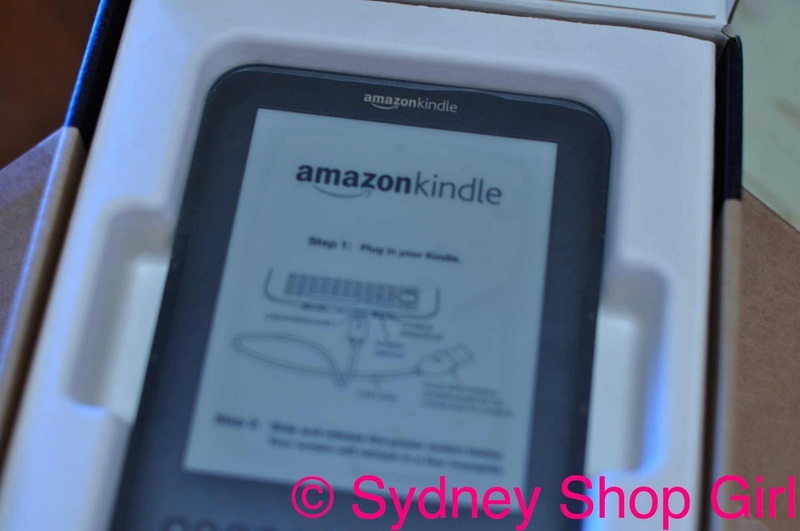 Sydney Shop Girl: Change and Kindles Are As Good As A Dramatic Haircut. Change and Kindles Are As Good As A Dramatic Haircut. Yes, it's still me. I just look a little... different. A few posts back, I was ruminating about hair. Scarlett Johansson's hair. How I would look with Scar Jo's hair. I'm still undecided as to whether I'm ready to go for the big chop. In the meantime, I've given the blog a complete makeover. It's been as liberating as changing hairstyles. It's also been as hard. Not technically, but letting go of the way the blog used to look. It's almost been as emotional as losing several inches of hair. 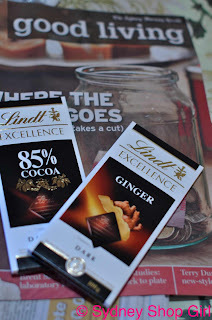 As it's 'Good Living' supplement Tuesday, I decided to bring good living to work in the shape of Lindt dark chocolate.For me, the chocolate equivalent of a dramatic haircut was buying ginger flavoured chocolate. I had a square with lunch today (for the anti oxidant properties of the chocolate and the numerous other health benefits of the ginger). It sounds a strange combination, but it works. The ginger proved to be very apt for Terry's restaurant review today. Terry has been exploring new directions in Thai cooking in Sydney at the moment. As opposed to the 'me too' suburban Thai restaurants. Which I love to bits. I have at least 8 Thai takeaway menus in my Kikki K menu organizer and I have a favourite dish or two at each restaurant. But the biggest change of the day was waiting for me at home. 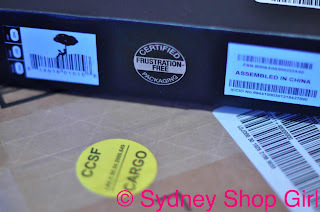 Opening the boxes was definitely frustration free but I encountered a few technical issues with the actual Kindle. My Kindle arrived from Amazon. It seems I'm not the only person in Australia taking full advantage of the brilliant exchange rate. Parcels arriving into Sydney have risen around 24% in the last 3 months. Surely it couldn't all be explained by my recent shopping adventures? I'm prolific but not that prolific. I'm still in the 'New Toy' excitement phase at the moment. I will do a post later discussing my first impressions of the Kindle and why I chose it over other e-readers. If there is anything you'd like me to address in the post, please leave a comment and I'll do my best to answer. Unauthorized Oprah and the Oprah endorsed Kindle. I've put it in its red case with pull out reading light. The light gets charged by the Kindle. 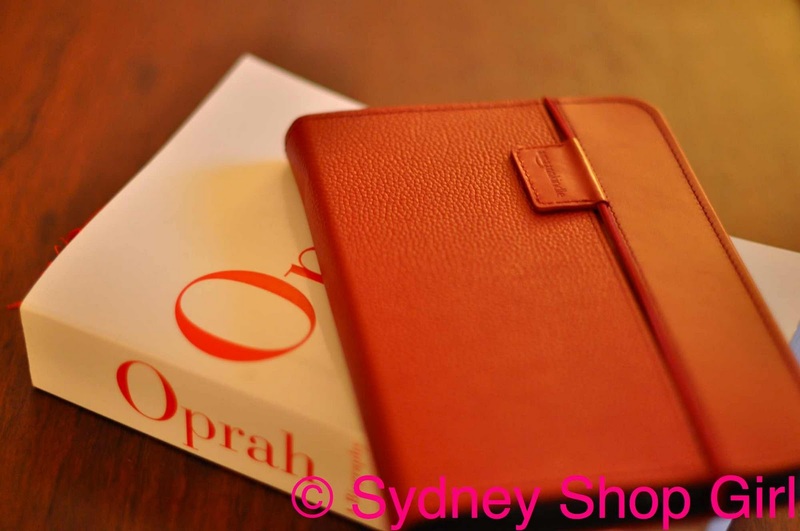 With my Kindle at my side, I feel one step closer to Oprah. Speaking of whom - the ticket lottery for her Australian shows still hasn't opened. That's going to be one more thing to happen in the last week of October. Can the week handle all the excitement, I wonder? In celebration of change, the first book I am reading on my Kindle is Eat Pray Love. Take care and I hope to return soon, if I can tear myself away from my Kindle. I have a Kindle. I love, love, love it. Particularly as I often run out of reading material and there is no bookshop closer than Perth and mail order takes a while. Also spent time in hospital recently and if I ran out of things to read I could just buy an ebook, any time day or night. I know it doesn't feel like a normal book but I got over that in about 2 minutes. I love the new look (and the new Kindle). Hope you're enjoying it- please just don't tell me that it's better than the Sony eReader (because that's what I've fallen in love with)! I like the cover though, I still don't have one as they're not in stock. eReaders seem to be getting more and more common- I think I'm spotting at least two a day now. Reading and chocolate go very well together! SSG - your blog makeover is a wonderful success. Love the ribbons! I have had a kindle for some time and it is fantastic just to have in your bag so you can read wherever you happen to be without carrying around a bunch of heavy books. And I love the speed - order a book and it's there within seconds. Amazing really! But about Eat Pray Love - I did not enjoy this book at all but wonder if I was just in the wrong frame of mind when I read it. I will be interested to hear your opinion - maybe I should attempt a second reading. P.S. About your hair - it always looks beautiful when we see a glimpse of it in your photos - that Scarlett chop looks a bit awkward to me. Love the new look! It's very fun! Mr Kitty bought a tablet PC rather than a kindle or an iPad. I am yet to read a book on it - I should really give it a go! I love the Lindt ginger chocolate. You are right - there is something very good about it! Congratulations on your new blog look! A change is always refreshing: )!